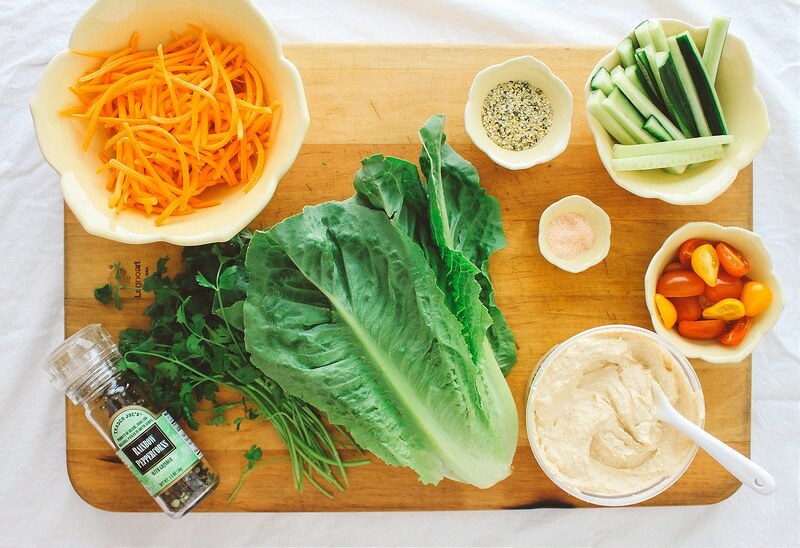 These Fresh Vegan Lettuce Wraps are colorful, healthy and delicious! This recipe is light and refreshing, and makes a perfect snack or light meal! 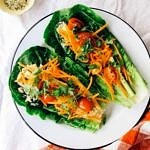 With summer in full bloom here in California, these raw vegan lettuce wraps are extremely refreshing and perfect for these hot summer days. High double digits call for something cool and fresh! These will hit the spot without weighing you down. Feel free to eat 4 or 5 and still be able to get everything done without needing to take a nap. That in my book is a very good thing! 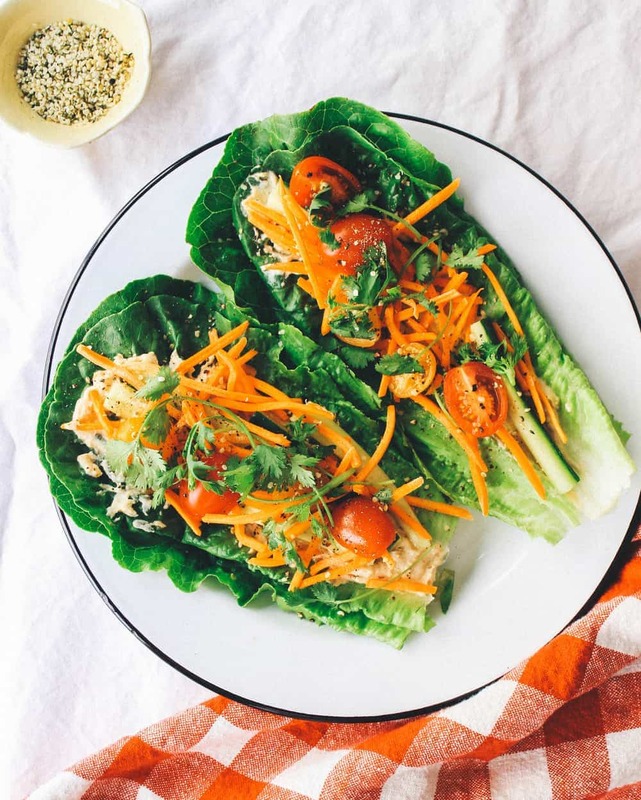 So when the temperatures rise, let these healthy & fresh veggie lettuce wraps come to the rescue to nourish & energize you. Bring on the summer, I’m ready! Simple is the name of the game here, so these are basic and can be adapted to suit your needs. I’ve used cucumber here, but zucchini would be great. Wanting to add some protein? Add a small handful of cooked chickpeas to each wrap. Try adding sliced bell peppers in place of, or in addition to, the other ingredients. Make these raw using this recipe for Raw Sprouted Hummus. Avocado would be a great addition to these wraps. A sprinkle of red pepper flakes wouldn’t be bad either. Then you can add the remaining ingredients over top ending with a sprinkle of hemp seeds, mineral salt and fresh cracked pepper. I’ve used romaine hearts as my vessel. I like to use one or two leaves for each wrap. I’ll use one larger leaf for the outside and a smaller one for the inside. 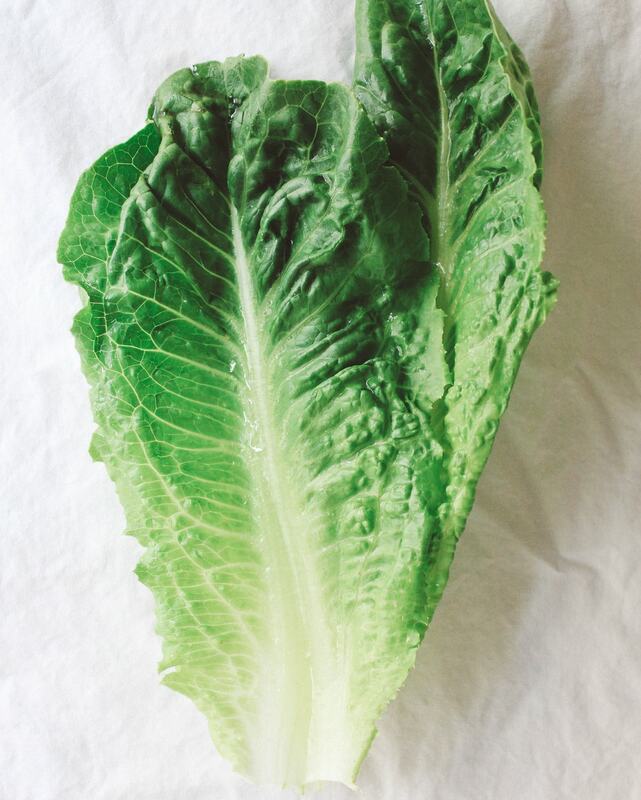 Other lettuces you can use would be butter, bibb, boston, savoy or iceberg. Swiss chard and lacinato kale would be great too. The swiss chard and kale will have a stronger flavor so if you’re looking for a lighter flavor stick with the others. As you see below, it fit perfectly in my hand and two leaves made it nice and sturdy. Such an easy and light lunch or dinner idea to throw together. It will keep you feeling light and clean! 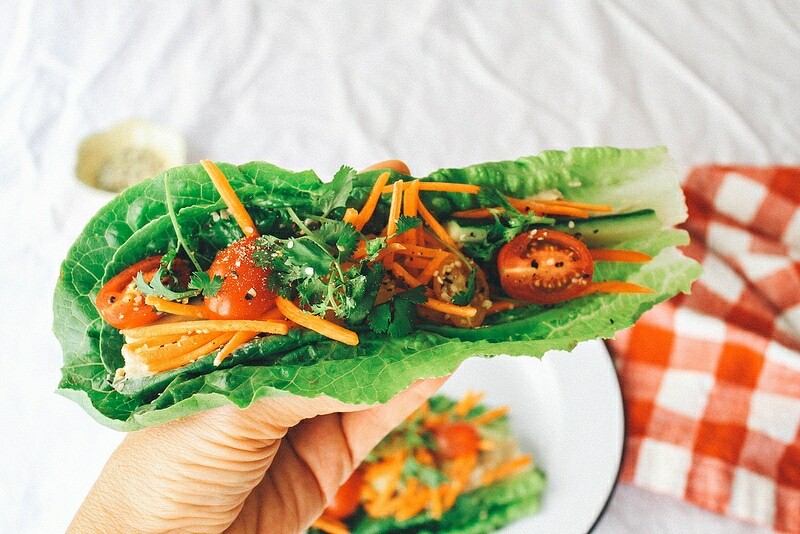 Fresh and light, these vegan lettuce wraps are a delicious summer lunch or light dinner! I’ll leave the amount of ingredients you want to use up to you. I would say a handful of the vegetables, and a sprinkle of the hemp hearts, salt and pepper. You really can eat about as much as you want here and I love it like that! Wash and dry your romaine hearts. I usually use 2 leaves together for each wrap, one large and a smaller one on top. Add a layer of hummus down the middle of romaine hearts, it’s ok to spread a little out toward the edges if you like. Layer first with cucumbers, carrots and then tomatoes. Add cilantro and top with a sprinkle of hemp hearts, salt and fresh cracked pepper. Enjoy as much or as little as you like! Other lettuces you can use choose from would be butter, bibb, boston, savoy and iceberg. You may also like to try swiss chard or lacinato kale. Any leafy greens that act as a wrap will do. The swiss chard and kale will have a stronger flavor so if you’re looking for a lighter flavor stick with others. Wanting to add some protein, add a small handful of cooked chickpeas to each wrap. Avocado would be a great addition to these wraps. A sprinkle of red pepper flakes wouldn’t be bad either.